A lot of tourists never venture far from Siem Reap and the Angkor Temples, but Cambodia has so much more to offer than this one singular experience! 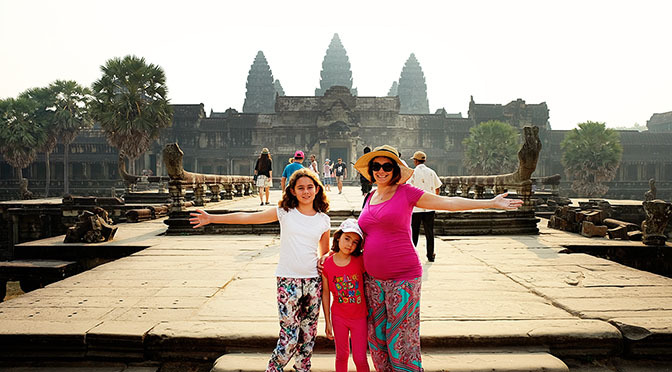 We really wanted to explore various different regions of Cambodia, together with throwing in a nice dose of relaxation! 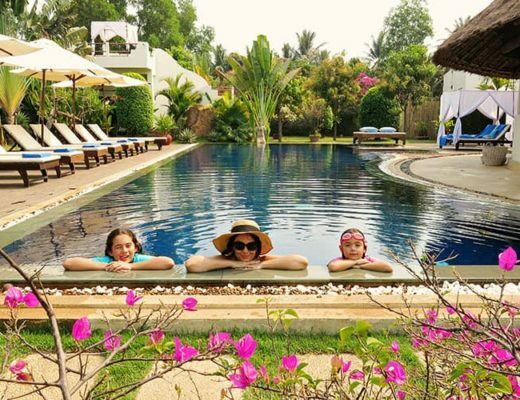 We chose to spend the end of our holiday at Koh Rong Samloem island and Otres Beach, to do just that! A perfect way to finish off a great holiday! If you want to travel from Siem Reap to Sihanoukville (or vice versa), you have several modes of transport options to choose from: including bus, plane, taxi and mini-bus. We recommend you visit Otres Beach above Sihanoukville, find out why in our post here. How far is Sihanoukville from Siem Reap? The distance from Siem Reap to Sihanoukville is around 532km (350 miles) by road. It is due to this long distance transfer (10-15 hours by road) that a lot of travellers choose not to travel to Sihanoukville at all. 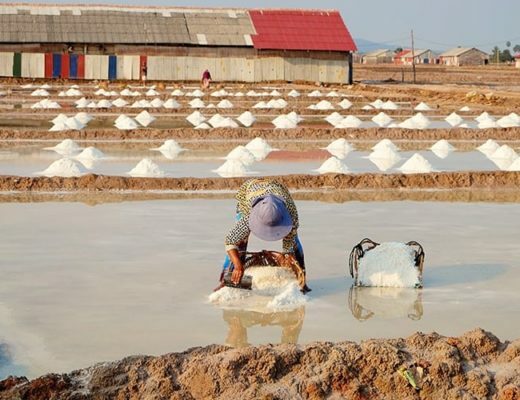 However if you build in a few other destinations (such as Kampot and Kep) into your trip to the South of Cambodia, the effort to reach this destination will be well worth it! 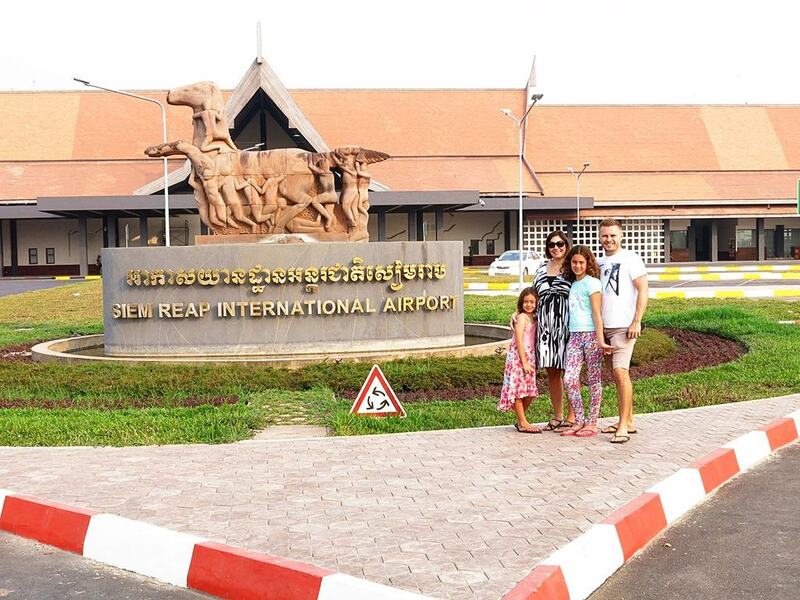 So if you are wondering how to travel from Sihanoukville to Siem Reap, we will outline the various options and hopefully make it easy for you to choose the one that suits you best! Being stuck on a bus when you need to pee! Avg US $25 BOOK NOW! Taxi drivers can pick you up and drop you off at your hotel. Great for sightseeing Taxi drivers are not always the safest drivers Avg US $130 BOOK NOW! 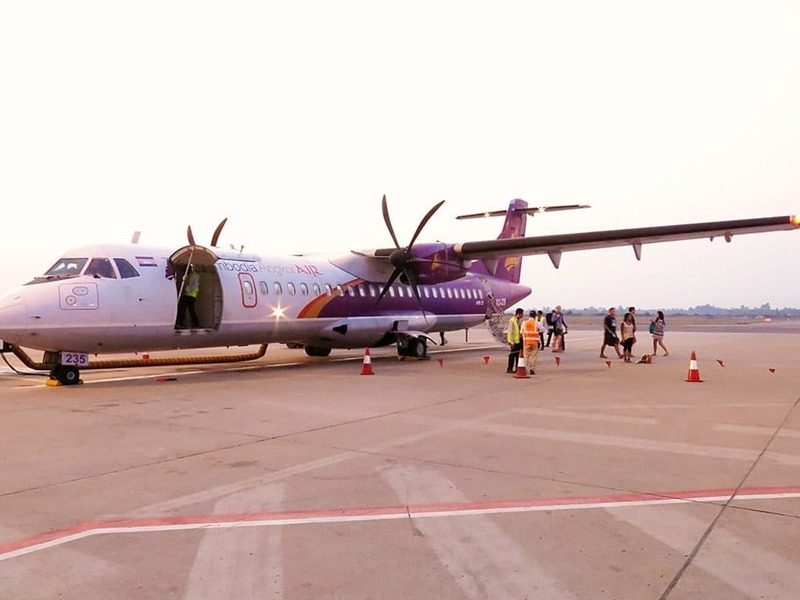 It is no surprise that choosing to fly from Sihanoukville to Siem Reap (or vice versa) is by far the easiest and it actually even happens to be cheaper than the taxi option! For us, choosing between a flight of slightly less than an hour, compared to a 10+ hour journey by road was a no-brainer! Traveling with young kids in tow, and I was in my second trimester of pregnancy, I can vouch for the ease of choosing the flight option, and I believe it is worth every dollar! Currently, there are two different airlines offering affordable flights from Siem Reap to Sihanoukville. Both domestic airports are pretty small. I think we went through the whole check-in and baggage scan process in about 10 min at Siem Reap. Sihanoukville airport is even smaller as you can see in the picture below! 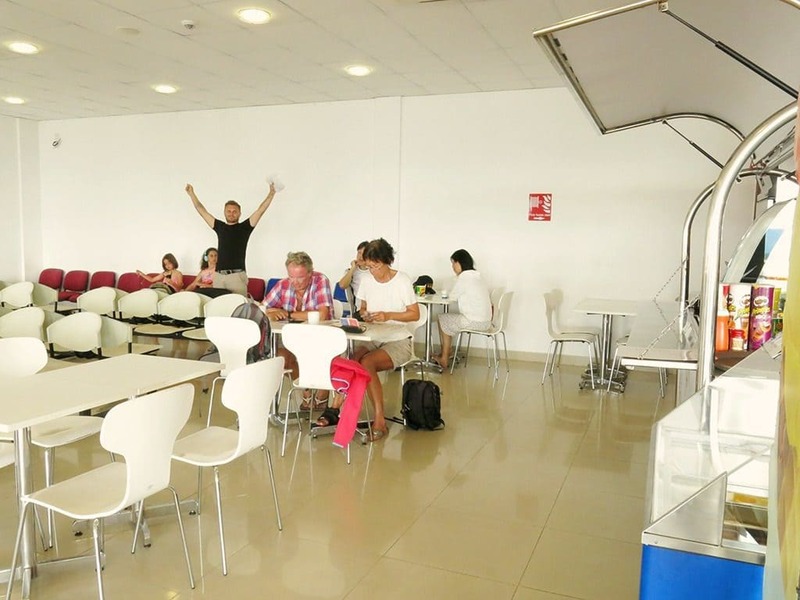 One thing I should point out is that whilst you can get some basic quick food at Siem Reap domestic airport, your choices at Sihanoukville is pretty limited to a muffin or two, a croissant or some sandwiches, so I would recommend eating prior to arriving at the airport! We chose to fly with Cambodia Angkor Air. This airline has the best reputation out of the airlines you get to choose from, the reviews I read all mentioned that it is the safest flight option as well. We had a really smooth flying experience. No complaints, the plane was on time, no issues at all. The typical plane for this flight is the propeller-style planes. It is important to note that your overhead compartment to store your carry on will most likely be smaller than normal (our bag could not fit in there at all), so think about what you can book in instead! Tickets can be purchased online: US$79 – US$115(flight) + US$23.90 (taxes) and this includes booked baggage of 20kg. There is generally only one flight a day from Siem Reap to Sihanoukville, and then a flight back from Sihanoukville to Siem Reap. So a choice of times will be limited. 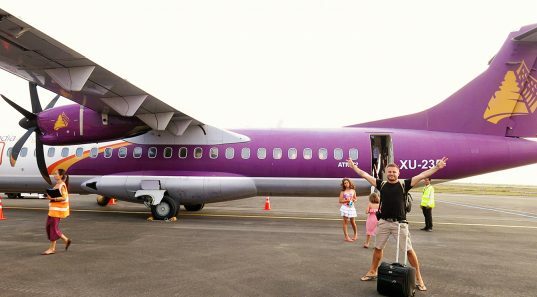 Banyon Airlines is a newer airline that also offers flights at similar pricing to Cambodia Angkor Air. It is worth comparing prices and flight times. Another option is to travel by bus from Sihanoukville to Siem Reap (or vice versa). Whilst we did not use the bus services on this trip, we did give bus travel a tester on a journey from Phnom Penh to Kep later in our holiday. Unfortunately, your choice of a direct bus from Siem Reap to Sihanoukville is very limited. If you would like to have a direct transfer, your only option is the night bus from Siem Reap to Sihanoukville and the company you need to book with; Virak Buntham; has a dreadful reputation for lying to travellers, as well as being incredibly unsafe drivers too. So I wouldn't recommend them! That leaves you with the option of having to go via Phnom Penh which doesn’t just add time to your journey but also a potential complete bus swap altogether. Where to purchase a ticket: You can purchase tickets easily from any tour company around the city, your hotel will be able to help you out with organising tickets too. Or a really handy site – BookMeBus.com allows you to simply just do it all online yourself! Nice and easy! Departure times from Siem Reap to Sihanoukville: Departure 7am, arrival 6pm. Another great option is Giant Ibis who has a great reputation! But you would need to book two tickets, one to get from Siem Reap to Phnom Penh and one to get from Phnom Penh to Sihanoukville. Again you can simply use BookMeBus.com to sort out your own tickets. Another choice of travel from Sihanoukville to Siem Reap is via taxi! I’m not sure that I would be keen to sit in a taxi for 10+ hours, however, this option might mean that you can work in a few stops where you want! Another benefit to a taxi over a bus is that you can ask them to stop whenever you need to have a toilet break! 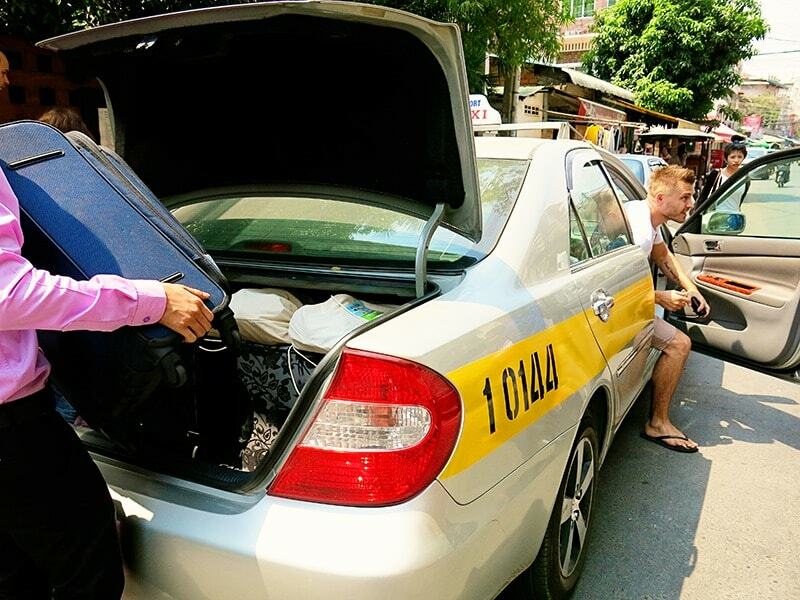 A taxi from Siem Reap to Sihanoukville will generally take around 10 hours to get from point A to point B. Taxi’s (can fit 4 passengers) costs around $150 for the journey, do make sure you arrange a set price before you hop into your taxi! Van Taxi’s (can sit up to 15 passengers) are more suitable for families or those with more baggage; don’t assume that they all have seatbelts though. They cost around $250, so best to negotiate your price before you leave. I honestly personally would pay the extra money and simply hop on a plane for this leg of the journey! Usually I love ground travel, but 10-15 hours is a long time out of your holidays to simply get from point A to B. But above all else, make sure you avoid taking the night bus option! Your safety is important, as well as your comfort, if you can afford the plane ticket, do it I say!! Have an awesome time on your holiday! !